Amateur do-it-yourself-er takes on a big renovation (getting in way over his head! ), but hopes to still have time for the tandem bike. When faced with an unpleasant task I usually put my head down and charge forward. For better or worse progress is made. It was with this mentality that we started the major demo at the house. While tearing out ceilings, it was only after Marci heard breaking glass and saw a bottle amidst the rubble on the floor that we actually took a moment to look at what we were doing. The bottle turned out to be quite old, lettered in raised glass with the name of our town, kind of. ‘Stroudsbury.’ What an exciting find, and not just because it was a good excuse to stop working. 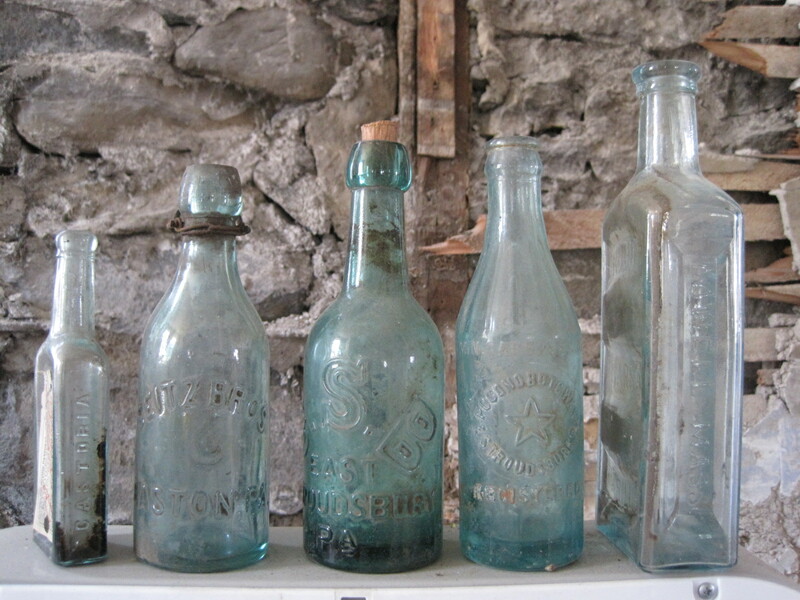 As we picked through the rubble we found some more old bottles with various names and symbols. Unfortunately we also found some broken glass and pottery. We then started looking in between the ceiling and attic floor, as well as at the end of the rafters (in the tight space where they meet the ceiling joists and exterior walls) to see if there was anything there. Clearly from a different time. We found several old shoes. Three, actually. I laughed at the thought of someone not being able to find that other shoe 100 years ago, and we haven’t found it either! As you can see in the photos, the shoes and hats are immediately evocative of long ago fashions. Although these styles have not come back into vogue yet (at least not in Pennsylvania), we’ll see. Marci may be ahead of the game with ‘new’ fashionable footwear! Also found were various hats of straw, leather and cloth. The start of a collection. Although it is immediately apparent that all these items are quite old, it is hard to know how old. Eighty years perhaps? With some research I’m sure one could get a general idea of their age. 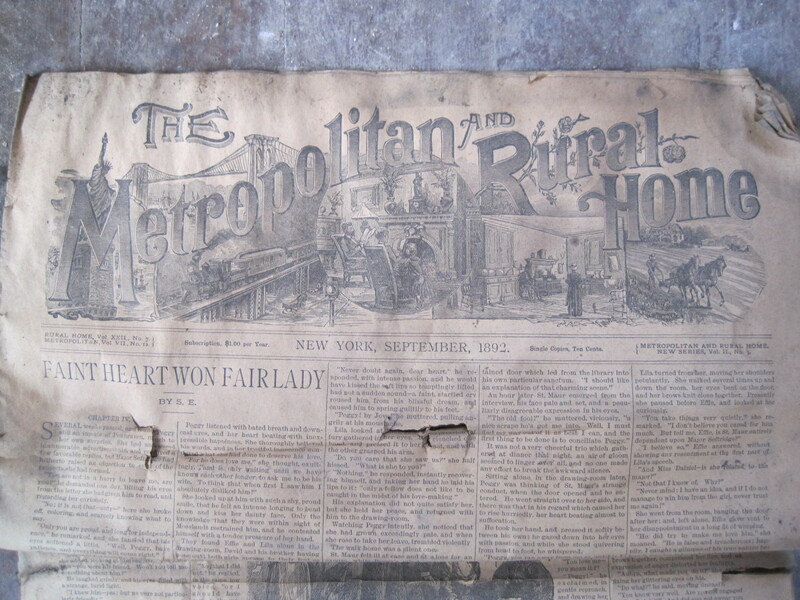 We also found some old newspapers in the ceiling as well. One was called ‘The Metropolitan And Rural Home.’ I guess they were trying to appeal to a wide audience. It is an old Agricultural Paper. The Metropolitan and Rural Home, September 1892. Although the content was rather dry, I was amazed to see a publication date of September 1892! Either the people who lived in this house bought and saved an antique paper, or this is further confirmation that the house is older than I was lead to believe! We also found a religious pamphlet, dated a much more recent 1906. Time is certainly relative because we then found some ‘collectible’ drag racing cards, dating to 1993. Although almost 20 years old, they hardly warranted a second glance compared to the 120 year old paper. 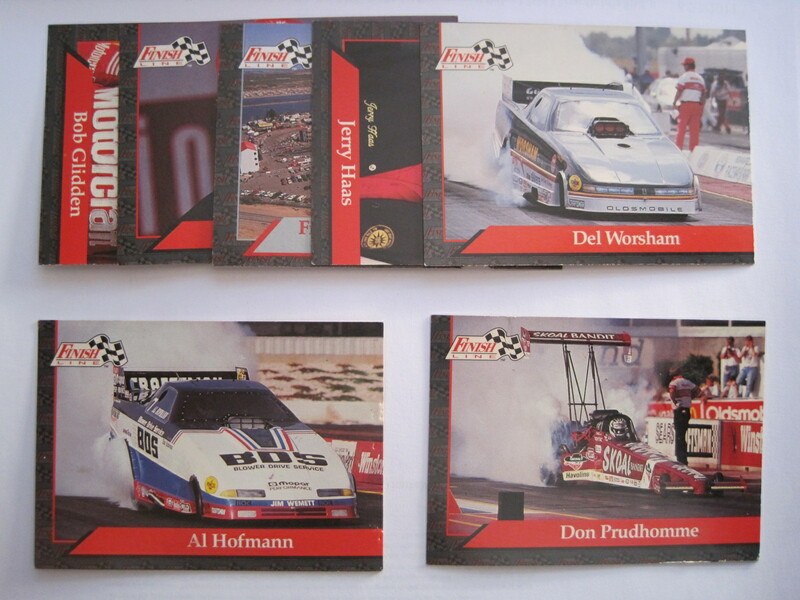 1993 collectible drag racing cards. Unfortunately, other than the glass bottles, all of this stuff was so old and worn it was worth little more than the novelty. However, it did put a human face on this old house. Many generations have obviously lived here. It was interesting to think that at one point someone pulled on these boots when new and perhaps felt proud, and quite stylish. Happy memories must have been made in this house. While thinking these thoughts I also realized that whatever triumphs, tragedies, insecurities or jealousies these various families and people had over the years, they were now as worthless as these old shoes. We read quotes to this effect all the time, but holding these shoes in my hands made me realize how true they are. We must enjoy our lives while we are living, because soon enough we’ll be no more than old shoes forgotten between the ceiling and attic floor . We continued the demolition, but with some care. As we found anything of interest we put it on the downstairs mantle. This old house kept revealing its age, in the way it was built, and in the people’s possessions it held. I look forward to a trip to our local historical society to do some research. In the mean-time, I will continue to enjoy becoming a part of the history of this old house. Love it! I had slippers here, some old letters, a newspaper or two – but never hats. (And funny how there’s been hardly anything in the house in England.) Have you been to the court house to look up when the house changed hands? It was the wife and mother who signed as the buyer of my house in 1892 – quite a big house, on the best street in town – and she signed with her mark. I think the Irish surname offers a clue: You know those wicked English didn’t believe in education for the uppity Irish. An articulate, literate population is so much more difficult to exploit. (Wild horses wouldn’t make me draw any parallels with the draconian cuts to U.S. education today.) Anyway – grand post – keep them coming! 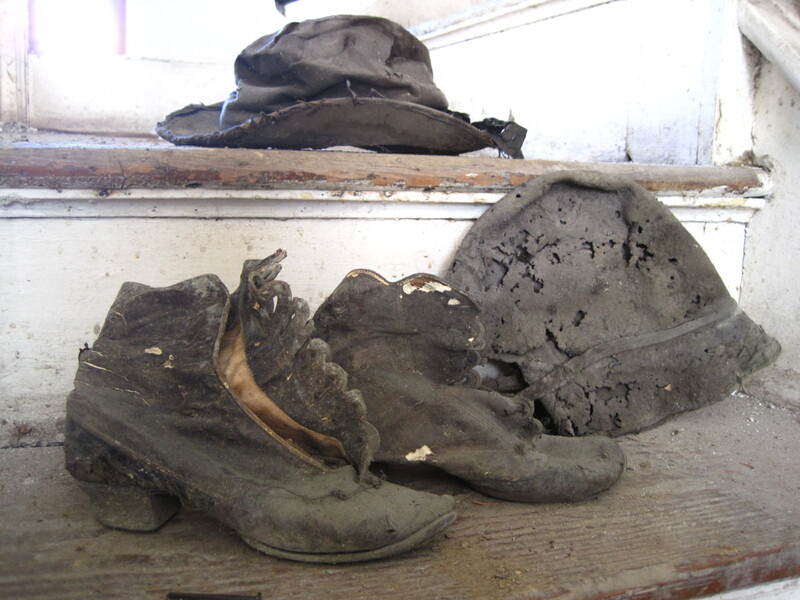 Thinking of the things that are found in these old houses makes me realize that we should be leaving ‘time capsules’ during our own renovations – I can certainly spare an old pair of shoes! 🙂 I haven’t researched the history of this house yet, but once I have you can rest assured I will be blogging about it! some of your shoes look that old. be sure to pass the goodies on to the new owners. 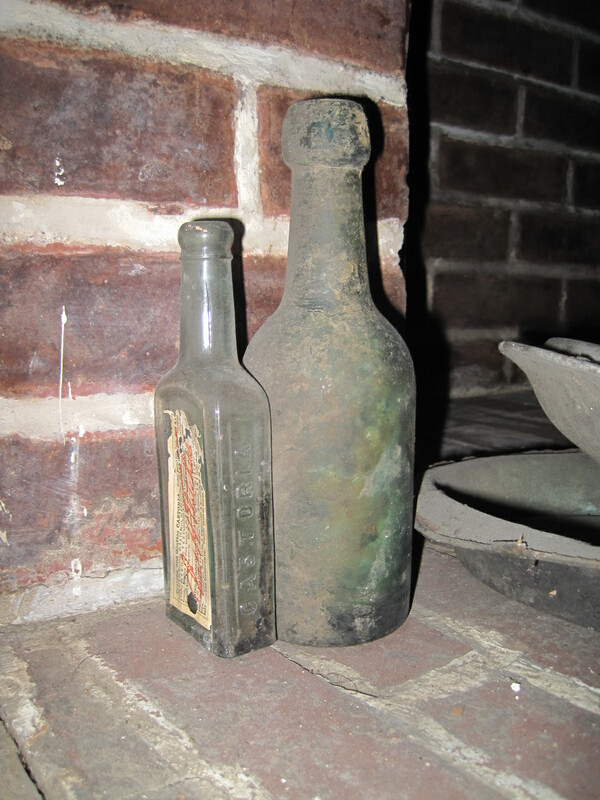 Can’t wait to see what else you find … take some of the bottles to the hist. soc. and see if they can id them. I do think that is one of the older homes in your area …can wait to see what you find out. uppity Irish — wait a minute……Christine. I am looking forward to spending a (rainy) day researching the history of this old house (after the roof is repaired). That’s a good idea to pass on the old shoes in the time capsule, perhaps along with a pair of more recent vintage. We just found some treasures in our old home too! Ice cream molds from the 19th century. Hope to see more! This old house has yielded most of its treasures, but certainly has a bottomless well of projects! The stuff you are finding is great – intriguing. I enjoy your blog too – more inspiration!